Home > Blog > Uncategorized > A New Toy! Net Logistics has recently taken possession of a brand new, high spec Dell PowerEdge m915 blade server. The blade is built around a four socket motherboard with thirty two DIMM slots. Add in a couple of hard drives and as you can see from the following photo, there isn’t much room for anything else. The server provided to Net Logistics came with thirty two 8GB RAM modules and four AMD Opteron 6180 SE Processors, with each CPU having twelve cores. 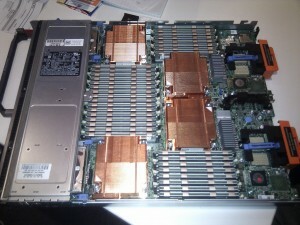 So the question was – what were we going to do with this beast of a server with 48 CPU cores and 256GB of RAM? As you can imagine our technical team were just itching to get their hands on this and put it to work! We decided that we would use this server primarily for testing rather than deploying any live systems on it. We also decided that we would be testing three different layers on this server – hardware, virtualisation and applications. Net Logistics is primarily an Intel environment and the vast majority of our servers run on CPUs produced by Intel so we were really interested in testing the AMD CPUs in this system to see how they fared. Obviously we were interested in testing the raw performance of these CPUs but our primary concern was to test their heat output and how well the server could dissipate the heat which was produced. Due to the density of the server componentry and the minimal space that this allowed for good air flow we certainly had our doubts. We employed a variety of benchmarking and stress testing software across both Linux and Windows and we maxed out all 48 cores for up to 48 hours at a time. What we found was that no matter what we did, we could not get CPU temperatures to rise above 61°C and all other chassis temperature readings were well within acceptable limits. We were pleasantly surprised! This server now and for at least the near future will be used for testing operating systems and applications. Once our virtualisation testing was complete we decided that this server would be running Citrix Xenserver in order for us to continue with our on-going in-house testing. It is currently running numerous virtual machines across a variety of different operating systems and we are using it to test many different classes of software and services such as hosting control panels, database servers, HTTP servers, high availability, clustering and many more. This on-going testing will allow Net Logistics to keep abreast of the latest software developments and assess their potential to both provide our clients with a wider array of services and to improve upon the services we have already implemented.